If your Alpine/Nordic plans are on hold, lap swimming makes a great exercise option. Finding a convenient pool for lap swimming is often difficult. 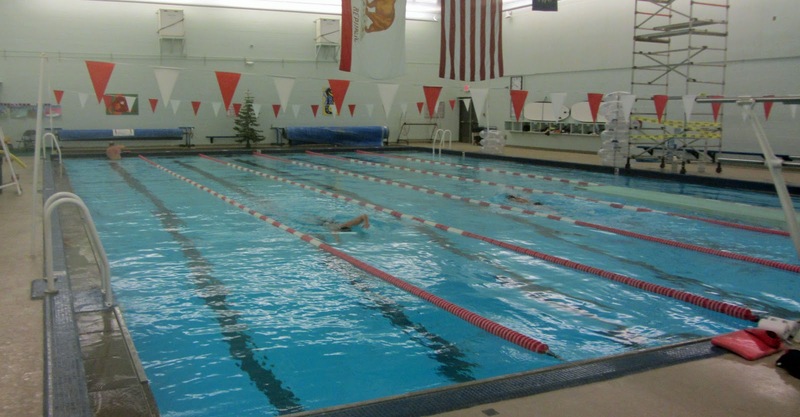 A proper pool is 25 yards long and has lane lines with hours set aside for lap swimming only. The Truckee Donner Community Pool in Truckee is a great place to lap swim. It’s an indoor 6 lane pool with hot showers and only costs $5 dollars for non residents. All levels of swimmers are welcome. I’ve seen beginners to an Olympic Gold Medalist (Debbie Meyer) swimming here. You position yourself in a lane based on ability. Faster swimmers use the middle lanes and slower swimmers use the outside lanes. The Truckee Community indoor pool. Tahoe area lap pools open to the public. Truckee Donner Community Pool, 11725 Donner Pass Road, behind Tahoe-Truckee High School. 530-582-7725 $5 dollar daily fee. Incline Village Community Pool, 980 Incline Way, Incline Village, NV (Behind the Hyatt). This is an indoor pool, 8 lanes wide and 25 yards long. 775-832-1321 $15 dollar daily fee. Idlewild Swim Center, 1805 Idlewild Drive, Reno, NV. 775-334-2267 This is an outdoor 8 lane 50 meter pool or 16 lane 25 yard pool. South Lake Tahoe Community Pool, 1180 Rufus Allen Blvd., South Lake Tahoe. 530-542-6056 This is a 6 lane outdoor pool with a plastic bubble for winter use. Carson Valley Swim Center, 1600 Highway 88, Minden, NV 775-782-8840 This facility has an indoor and an outdoor 25 yard pool. $3.50 dollar daily fee. There are a number of private pools that have lap swimming, but they aren’t open to the public. Tahoe Donner for example, has a nice pool, but if you don’t belong to the Association, you’re out of luck. Swimming is easy and fun. Whether you swim poorly, or like a dolphin, the exercise is all the same. There is always someone in the pool or on the deck willing to give you proper stroke tips and pointers if you ask. This is part of an article where you will find some useful tips on how to get of sports discount as well as some useful links to swimming accessories. So, You can easily buy all sports things with discounts. Swimming laps is the suitable, perfect and low impact exercise for people of nearly any age even among professional swimmers. In order to studymoose.com reviews there is one thing that seems to separate the good people the great people.